"A filling that can be used for cakes. You can substitute any berry you like: blueberry, strawberry, pear, or blackberry. A filling with endless possibilities! I use this in a variety of cakes and its always a hit! It will be enough for 1 cake or 12 cupcakes." 1Combine raspberries, sugar, 3/4 cup water, and lemon juice in a saucepan; bring to a boil. 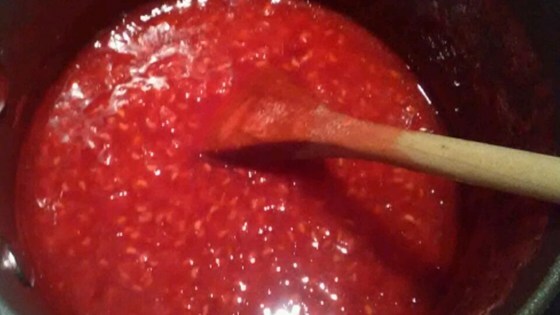 Reduce heat to medium-low and simmer until reduced, 15 to 20 minutes. Remove saucepan from heat and strain through a fine-mesh strainer into a bowl. Pour mixture back into the saucepan. 2Mix remaining water and cornstarch together in a bowl until dissolved; add to raspberry mixture. Bring mixture to a boil; cook, stirring occasionally, until thickened, about 5 minutes. Cool filling in refrigerator, at least 30 minutes.